What To Know About The Independence Referendum In Iraqi Kurdistan : Parallels In a referendum scheduled for Monday, Kurds are expected to vote in favor of separating from Iraq. International opposition to the referendum is overwhelming. A campaign poster next to a Kurdish flag in Irbil urges people to vote yes Monday on independence from Iraq. About 6 million Kurds — almost 20 percent of the the Iraqi population — live in the Kurdistan region of Iraq, as well as in Baghdad and a swath of territory claimed by both the Kurds and the Iraqi government. 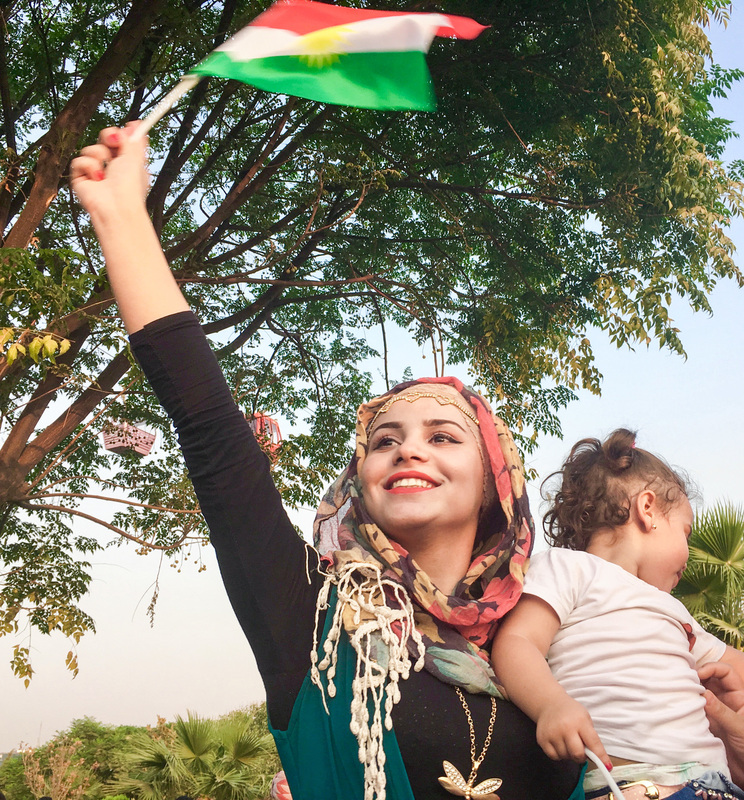 Rogesh Adnan Yasin, a Syrian Kurd, holds a Kurdish flag and her 2-year-old niece at a pro-referendum rally in Irbil, Iraq. Yasin believes that if Iraqi Kurds achieve independence, her Kurdish region of Syria will be next. Kurds generally speak different dialects of the Kurdish language — although in Turkey, it was once considered a crime to speak Kurdish. Have the Kurds ever had their own country? When the Ottoman Empire was dissolved after World War I, Kurds demanded their own state, but hundreds of thousands were expelled from their traditional areas and dispersed to other parts of Turkey instead. After World War II, the Soviet Union backed a Kurdish self-governing state in what is now Iran. That state, the Republic of Mahabad, lasted less than a year. 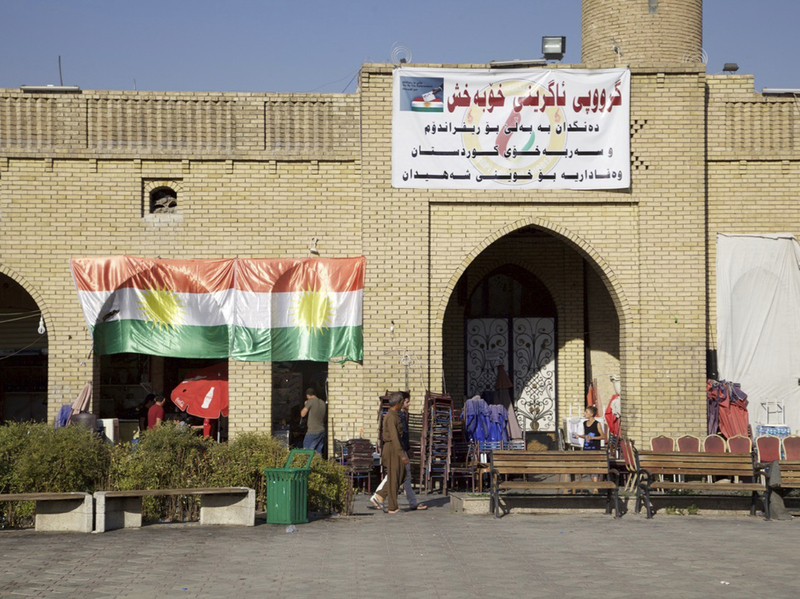 The most autonomy Kurds have had since then is in Iraq. In the three northern Kurdish provinces, Kurds control the land borders with neighboring countries, elect their own parliament, maintain their own security forces (known as the peshmerga) and draft their own laws. What was the U.S. role in helping to create modern Iraqi Kurdistan? After Iraqi leader Saddam Hussein invaded Kuwait in 1990, the U.S. formed a coalition to drive him out in 1991. The Kurds (and Iraqi Shiites in the south) rose up against him. The Iraqi army attacked the north, and more than 1 million Kurds fled their homes and tried to escape over the mountains in winter. Thousands died. That year, the U.N. Security Council approved a U.S.-led no-fly zone preventing Iraqi planes from flying over the north and south of Iraq. In 1992, Iraqi Kurds established their own regional government. The decade that followed was a tough time. The Iraqi government punished the Kurds with trade sanctions, and the Kurdish region was included in an international trade embargo against Iraq. After 2003, when Saddam was toppled, Kurds started rebuilding and foreign investment poured in. Why do Iraqis Kurds insist on independence? Most Kurds say they will never feel safe as part of Iraq. From 1986 to 1988, Iraqi forces destroyed thousands of Kurdish villages in a campaign by Saddam's Arab Socialist Baath party to "Arabize" northern Iraq. At a conservative estimate, more than 100,000 Kurds were killed. Chemical gas attacks in the town of Halabja in 1988 killed thousands of women and children. 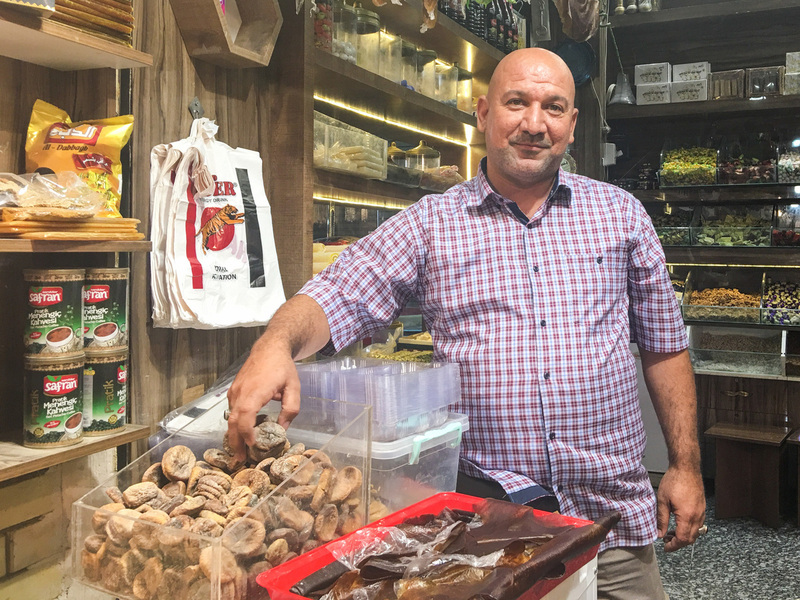 "You will lose nothing if you vote yes, but if vote no, you will lose something," says Saad Abdul Razak at his shop in Irbil's historic market. Saddam is long gone — he was convicted of war crimes and executed in 2006. But many Kurds believe they will always face threats from an Iraqi Arab government. They also blame Iraqi Arabs for the rise of ISIS, which has massacred members of the ancient Yazidi minority. The Kurds consider Yazidis to be Kurds. An estimated 2,000 Iraqi Kurdish peshmerga forces were killed fighting ISIS. The Kurds also want to control their own economy. When ISIS attacked three years ago, Iraqi forces refused to fight. Kurdish fighters moved in to push ISIS back and took control of some of the biggest northern oil fields, as well as the disputed city of Kirkuk. The Kurdish government accuses Baghdad of reneging on an agreement to give it a share of oil revenues. Baghdad says the Kurdistan region is illegally exporting oil. That has led to an economic crisis in the Kurdish region. Which countries are supporting the Kurdish independence referendum? Israel is the only country that has come out in favor of it. Israel has long-standing security and business ties to the Kurdistan region and would love to have a non-Arab ally in the Middle East. In a more lukewarm endorsement, France — after initial opposition — recently said it wouldn't oppose the vote taking place. But the United States and some of Iraq's neighbors oppose the referendum. Iran and Turkey have warned the Kurds not to go ahead with the vote. The U.S. wants to avoid the prospect of another conflict between Baghdad and the Kurdish government while they are still fighting ISIS. After 2003, Kurdish leaders agreed to an Iraqi constitution that calls for negotiations over disputed areas, so holding the referendum in Kirkuk and other cities now is seen as provocative. 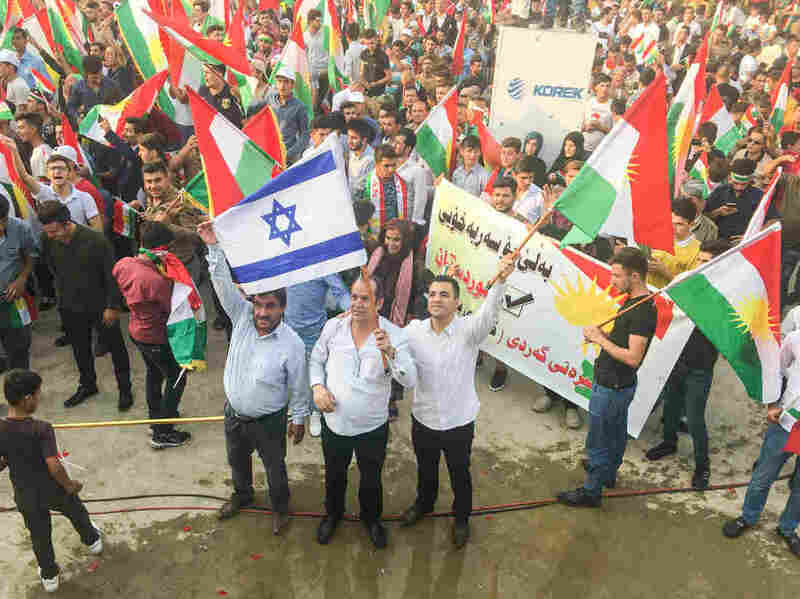 Kurds wave Israeli flags at a Kurdish independence rally. Israel is the only country in the region to support the referendum. Iraq's neighbors are worried that a Kurdish state would encourage their own Kurdish populations to try to break away. The Iranian, Turkish and Iraqi foreign ministers announced Friday they would take coordinated measures against the Kurds — likely economic sanctions — if they go through with the vote. Why is the referendum controversial within the Kurdistan region? The vote is being driven by regional President Massoud Barzani, whose Kurdistan Democratic Party controls the Kurdish regional government. Barzani is 71, and many believe he wants the referendum to be part of his legacy. But there are deep divisions among Kurdish political parties. Although Barzani still holds the position and power of president, his term actually ended two years ago. Until last week, Parliament hadn't met for two years after the Parliament speaker, who is from an opposition party, was blocked from entering. Some Kurds believe that their political leaders should be working on strengthening democracy and rescuing the economy instead of holding a referendum. There is also discontent about corruption among Kurdistan's political dynasties while people like teachers and the peshmerga go without salaries because of the economic crisis. Is there a chance that voters won't support independence? No. There is a "No for Now" campaign that argues this isn't the right time — but even Kurds who are on the fence are overwhelmingly expected to vote yes. So what does holding the referendum actually mean in the end? It's a signal and a statement of intent that Kurdish leaders plan to pursue independence. But there's no timeline, and the vote doesn't trigger any moves to independence. It's likely though to trigger retaliation from Iraq's neighbors and allies. The Kurds supporting this, though, believe it's worth it.